She's Fantastic: Star Wars Black Series - QI'RA (CORELLIA)! Star Wars Black Series - QI'RA (CORELLIA)! I just saw Solo: A Star Wars Story last night and I was really impressed. My previous criticisms about the designs were pretty unfounded. 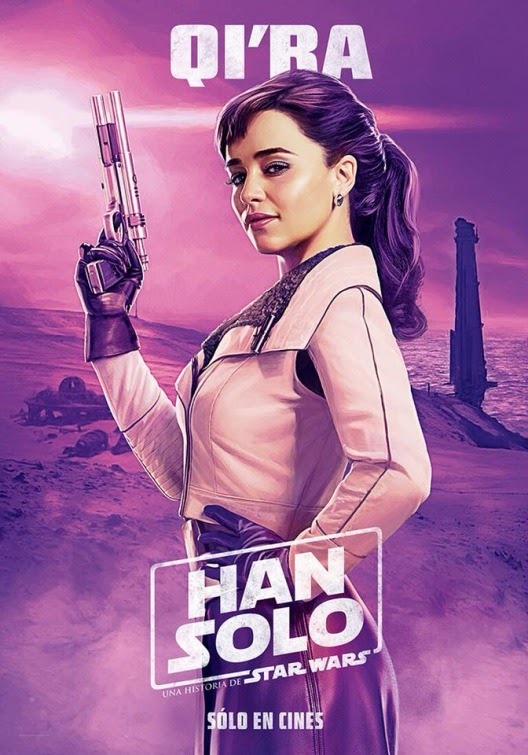 I had complained that the outfit we see here on this Qi'Ra action figure looked way too modern, but in the film it actually fits in. If I recall correctly, this particular outfit is almost always shown in either dim silvery-blue lighting or while seated in a vehicle, so it's not as distracting as I feared. When I got home from the theatre, I immediately started Googling to see what other toys we would be getting and I was happy to discover that we will be getting three additional 6" females from the movie (don't research that if you don't want spoilers). And that's not even including any additional Qi'Ra figures. There haven't been any announced yet, but she had several iconic looks in the movie (the caped one was my favorite) and if she follows the trends set by Leia, Rey, and Jyn, she'll likely get at least one more figure. I'm excited to see what the future will hold. Let's check out Qi'Ra below! Qi'Ra's gun is articulated! I honestly don't remember her having a gun when she wore this outfit, so perhaps the accessory is reused from another character. The vest part of her jacket (but not the sleeves) is removable. I didn't get a picture of this. Here she is with her 12" counterpart.